More than 70,000 copies sold in English and over 100,000 in the Chinese translation. Russian, Japanese, Korean and Turkish editions have also been published. 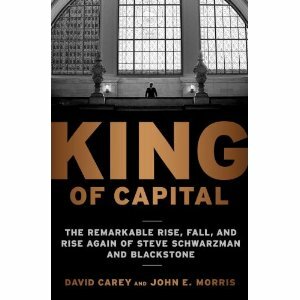 “King of Capital aspires to be a serious portrait of Blackstone and the way that Schwarzman so brilliantly built it up, scoring numerous coups along the way and avoiding the mistakes of many competitors. And it does a fine job in what it sets out to do…. “This book provides an excellent introduction to the world of private equity and its many permutations for those of us who are non-finance majors. More a biography of the industry than of Stephen Schwarzman himself, King of Capital chronicles the recent history of the leveraged buyout (LBO) industry, with descriptions of financial deals and examples that help to define industry concepts and techniques. But the book is no dry tome – the authors mix in enough intrigue, drama, financial complexity and high-society hustle to make a fascinating story.“–Jan Wallace, University of British Columbia Sauder School of Business in Business in Vancouver, April 5-11. “King of Capital …. recounts the history of one of the financial industry’s most successful firms and one of the current generation’s top financiers. It also offers an education in the world of deals, and in coping with management challenges…. The book carries the ring of authority in part because the journalists obtained a remarkable degree of cooperation from Schwarzman and others at the Blackstone Group…. “[Carey and Morris] explain how each deal built [Schwarzman’s] fortune then report on what he did to show off his mountain of money. The tale is complex, but for those who want to know how to make billions of dollars with other people’s companies, it is a compelling read. They tell the story of Schwarzman’s luxobarge — a monstrous yacht he used to go to an intimate lunch for two on a Caribbean beach. There’s the tale of another gathering, his 60thbirthdayglitterfest, staged at the Park Avenue Armory in New York, which Schwarzman gussied up to be a perfect copy of his US$30-million apartment, with crooning supplied by geriatric rocker Rod Stewart for what the authors speculate was a US$1-million fee. “When I heard this book was coming out, the finance nerd in me eagerly awaited and found [out] which local store would get it the fastest because I didn’t want to wait for the online shipping time. So, I bought it yesterday and read it in a day. It’s awesome. Steve is a genius in so many ways, and the book does a good job of balancing personal/lighter stories along with the heavier finance stuff. You learn about Pete Peterson . . . and how together they formed what’s still the worlds largest PE firm. . . .
I’m being purpos[e]ly vague because I want people to read and experience this book for themselves. “[R]anks as one of the most even-handed treatments of the industry. The book, a history of Blackstone Group and its founder, chairman and chief executive officer Stephen Schwarzman, is also a story of the asset class in which Blackstone has made its name. “The best non-fiction books about complicated, important subjects make the complexities understandable but also bring the lead characters to life. Whether explaining the origins of the leveraged buyout frenzy, unraveling the byzantine corporate structure and personality-driven mini-dramas upon which Blackstone was built, narrating the ins and outs and ups and downs of dozens of Blackstone’s celebrated deals, or introducing us to an absent-minded Pete Petersen walking around with post-it notes on his lapels, David Carey and John Morris do all that and more. This book is as important as it is fun to read.” –Steven Brill, founder of Court TV and The American Lawyer magazine, author of The Teamsters and After, and co-CEO of Press+. The book has been excerpted or quoted by the New York Times, Wall Street Journal, Fortune, New York, TheStreet.com, TheDeal and Clusterstock.